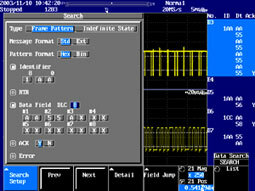 This oscilloscope offers maximum memory length, among other features. Super-long memory enables you to capture high-speed phenomena for the desired period of time, while providing fast sampling speeds required for reliable measurements. Up to 32 MW of data (with the DL1640L) can be acquired even when all four channels are used. As shown in the picture, during the evaluation of a switching power supply, for example, this capacity lets you capture three different signals (switching element voltage, current, and primary-side surge current) from the time the power is turned on until switching starts and stabilization occurs. Super-long memory also lets you maintain high-speed sampling, so individual pulses can be accurately displayed on the screen. The zoom function rapidly displays the target phenomenon contained in large amounts of waveform data. 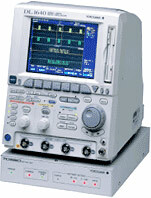 The Dual Zoom function enables you to zoom in on two portions of the waveform at one time. All-points display shows all of the data stored in long memory. 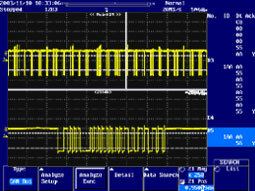 This display mode shows phenomena that may be missed in a compressed waveform display. With Yokogawa's proprietary Data Stream Engine II, screen updating speed does not slow down even during zoom display or automatic parameter measurement. With fast screen updating, display changes corresponding to modified settings take place instantaneously, so instrument control is responsive. "I want to find the serial data with a particular serial pattern", "I need to search for surge pulses of less than 30 ns", "I want to only extract waveforms that occasionally overshoot by an excessive amount".......As data volume increases, it becomes more important to be able to search for target phenomena efficiently. The Smart Search function automatically detects serial patterns, pulse widths, rising edges, falling edges, and other phenomena in the captured waveform data. These phenomena are then displayed in the zoom screen. Smart Search will significantly improve the efficiency of your development and evaluation work. 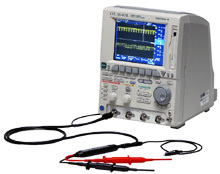 One important role for oscilloscopes is measuring noise in the waveforms. Sometimes, however, this noise prevents you from observing the target signals. The real-time digital filtering lets you easily apply a low pass filter while capturing data, so that waveforms hidden in noise can be clearly displayed. Filters can be set separately on each channel. In combination with an analog filter, cutoff frequencies ranging from 20 MHz to 10 kHz can be set. When the real-time digital filtering is used in high-resolution mode, data resolution increases to up to 13 bits, and signals can be reproduced even more clearly on the screen. This helps to evaluate ECU signals containing ignition noise and inverter output superimposed with high-speed switching noise. Have you ever missed an abnormal waveform because it disappeared from the screen before you pressed the stop key? The Advanced History Memory Function Reliably Captures the Waveforms You Want. The history memory now has increased capacity for automatically storing data. History memory can now store up to 16,000 captured waveforms, depending upon record length. It would be difficult to search manually through thousands of history waveforms. Yokogawa's history search function automates this process for you. The history search lets you define zones on the screen, and find all previously captured waveforms that either pass through or bypass the user-defined zone. You can also run searches based on specified waveform parameters. This function performs statistical calculations on waveform parameter values stored in history memory. Parameter maximum value, minimum value, average value, and standard deviations can be calculated and displayed. You can view the calculation results for each waveform on a full-screen menu. 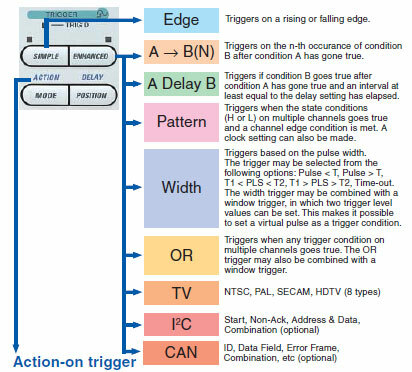 With the action-on trigger, a specified action is automatically executed each time the trigger is activated. You can use the trigger for a variety of actions, such as automatically saving captured data. The action-on trigger is useful for purposes such as collecting data in continuous tests. 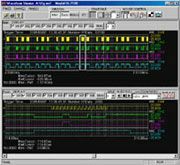 Frustrated by the many limitations of oscilloscope rolling displays? The Roll Mode Function Goes beyond What a Recorder Can Do, Allowing You to Record Low-Speed Signals in Real Time. Roll mode is effective for observing low-speed signals. 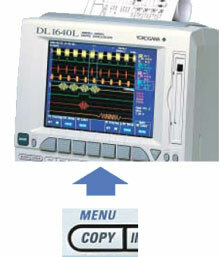 In this mode, the waveforms move across the display similar to the way a recorder operates. With the Triggers based on the pulse width. With the DL1600 series, roll mode can be set as fast as 50 ms/div. 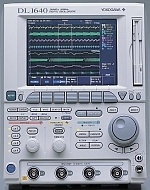 They have fewer roll mode limitations than other oscilloscopes. This function allows you to observe waveforms in roll mode, while checking zoomed waveforms and results from waveform parameter calculations such as peak-to-peak values, frequency, and FFT calculations. Envelope mode allows you to maintain a sampling speed of 200 MS/s regardless of the time-axis setting. This ensures that high-speed noise such as a surge pulse is captured, even when you are observing slow phenomena in roll mode. 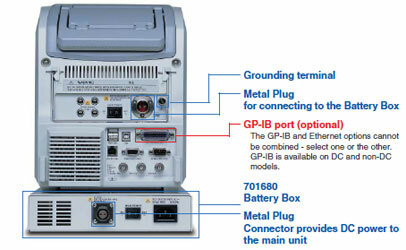 A 3-mode power supply (DC power model) that adapts to the various measuring environments, for in-vehicle tests and field use. Want to compare parameter values for each cycle starting as soon as the power is turned on? During power supply evaluations, this function lets you calculate voltage and current maximum values and periods for each switching cycle starting as soon as the power is turned on. Maximum value, minimum value, average value, and standard deviations are calculated automatically for each waveform parameter. In addition, you can instantaneously search for the cycle containing the maximum or minimum value and display it on the zoom screen. Do you often count the number of pulses on the screen? Without many pulses this is time consuming. During the evaluation of electronic circuits, you often need to count the number of pulses, such as the number of rotation pulses in stepping motors, tracking error signals on optical disks, interrupt signals from a MPU, and clocks of serial data buses. The pulse count function automatically calculates the number of pulses in a waveform. This function determines waveform data in a measured waveform based on specified zones or waveform parameters and automatically performs a specified action. Available actions include printing screen images, saving waveform data, sounding an internal buzzer, and sending an email. The DL can be driven directly from an in-vehicle battery. The DC power model yields approximately 2 hours* of operation using the battery box (with internal charger). Auquired waveforms are unaffected by the power supply noise. *The operable time varies depending on usage condition. Connect the DL1600 series to your PC through the Ethernet connection. This allows for easy remote operation using Internet Explorer. USB flash memory (USB rev 1.1 compliant) can be used for saving a variety of data files, including waveform data*. When you select the PC card interface as the removable media type, you can use ATA flash memory cards, compact flash, high capacity microdrives, and other media. Additionally, 2 MB of flash memory is built into the main unit. The flash memory is convenient if other storage media is not handy. When you want to save waveform data, it's not easy to press multiple keys while keeping the probe on the target point with one hand. The snapshot function lets The snapshot function lets the screen with a single touch, making waveforms easier. In addition, waveform data saved with the snapshot function can be saved to storage media, then loaded later. Simply press the COPY key and immediately print the current screen image using the built-in printer, a USB printer or a network printer. 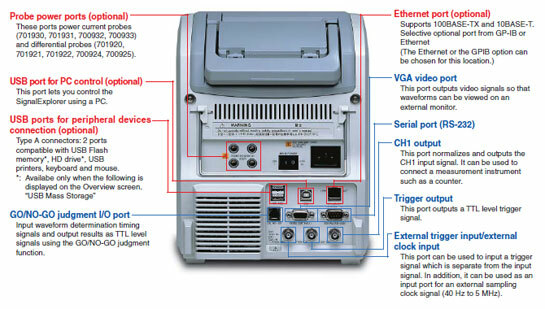 The built-in printer is ideal for printing that "just gotta have" image - in the lab, or in the field. Want to check saved screenshots quickly? Simply press the IMAGE SAVE key to quickly and easily save image data to a PC card or other storage media. Data can be saved in BMP, TIFF, PS, PNG, and JPEG formats. You can easily review thumbnail images. Both the image and file name are displayed. On the review screen you can check the images, and also change file names and delete files. Identifier (ID) Field trigger: 4 IDs can be specified. RTR Field trigger: The trigger is activated by Remote frame. Data Field trigger: You can set data of 1 to 8 bytes. You can set trigger conditions with a combination (logical AND) of these five types of triggers. Determine bus level (recessive or dominant) by specifying the sample point as a percentage of the total bit time. Use up to 32 megawords of memory (DL1640L) to acquire long strings of CAN bus waveform data and then analyze the data in a time-series manner. Analysis results are then listed along with the waveform. Results include: ID and Data fields, ACK field status and other information. 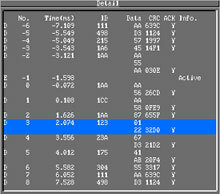 The frame which is highlighted by the cursor on the analysis results list automatically appears in the zoom window. This feature enables you to observe the bus signal while concurrently viewing the analysis results. Thus, you can easily verify how noise or level fluctuations affect the communication data and carry out debugging work very efficiently. Use the high-speed data search function to search all acquired frames. Search for user-specified ID, RTR, Data, or ACK codes. This function can also search for error frames. A magnified view of the frame found is shown in the zoom window. This function can also search for a frame containing an Indefinite state. 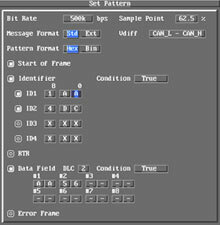 Even for frames comprising as few as 100 bits, the Field Jump function automatically finds the starting point of a Data or Control field and shows it in the zoom window. The CAN cursor function displays the selected Field range, and lets you move bit-by-bit in the field for easy troubleshooting. This function calculates and extracts the stuff bit from the frame data and represents it as a waveform. 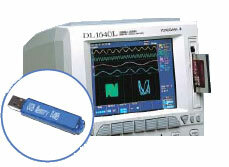 This enables you to easily confirm codes of waveforms. For the DC power supply model (-DC). Powers instrument for approx. 2 hours. Charging time: approx. 4.5 hours.